Solid RV Entry Steps - Luxe Elite, Gold and Luxe Toy Hauler. With these steps you are anchored on solid ground. Soft touch walls add a very quiet interior and an extra R-Value. 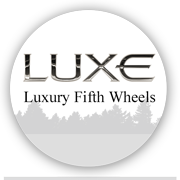 Come for a tour and listen to the difference a soft touch wall can make in your luxury fifth wheel environment. Did I mention the real hardwood dovetail soft close under glide drawers? Large pantry! Here is a shower you can actually stand up in. Go ahead and step into that shower. Even if you are 6' 4" you will have 2 inches to spare. You can actually see the view outside your window as you wake up in the morning. 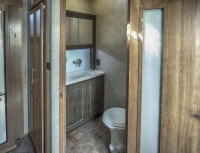 There are 3 windows in your Luxury fifth wheel master bedroom. And if you don't like the view, you can always move to a different location. Do that with your brick and mortar house! Idea! Here is one idea for an exterior full body paint scheme for the Luxe Toy Hauler. What do you think?